#595 at North Freedom, April 2000. Paul Swanson photo. 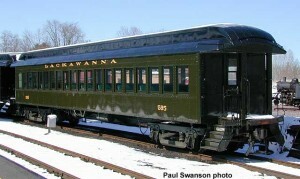 #595 was constructed by the Pullman Company in 1914 as part of a major order for steel passenger cars to be used in the Lackawanna’s steam powered suburban service out of Hoboken, New Jersey. These cars were considered to be one of the last large orders of open-platform coaches ever built. Their simple design provided economical, short-distance transportation. The coaches, 64 out of the total order of 77 cars, had a seating capacity of 78 passengers and weighed 108,000 lbs. They served faithfully in commuter service for some 55 years until a vast majority were retired in 1970 following the arrival of more modern equipment on the New Jersey commuter rail lines. 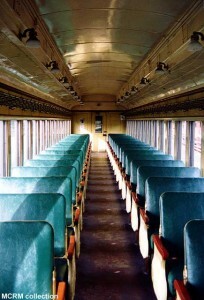 Since the beginning of operations at North Freedom in 1963, Mid-Continent had used only wooden passenger cars in its operating train. The wear and tear of daily use proved a strain on volunteer forces, and a more durable steel coach was sought. 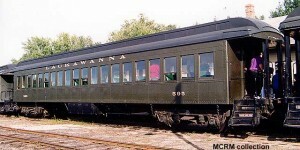 The availability of the Lackawanna “Boonton” cars (nicknamed for the branchline where they served) was timely, and Mid-Continent purchased three (including the #595) in 1972 for use in the daily train. The cars, although steel in construction, have a similar appearance to wooden coaches in the fleet, thanks to their traditional construction design with open platforms, clerestory roofs, and windows that open. 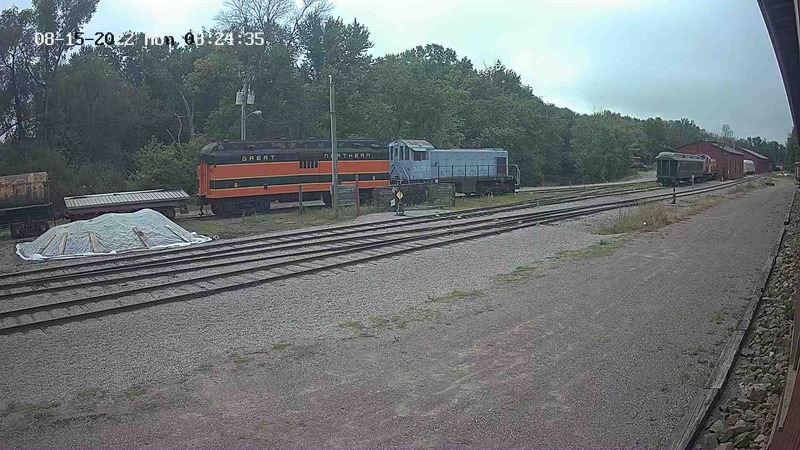 All three Lackawanna coaches are presently in service at Mid-Continent, wearing the Pullman green paint scheme with Lackawanna lettering and numbers as they did in later years on the DL&W. 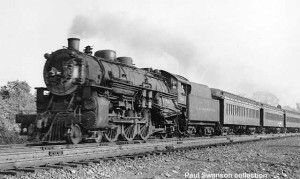 The Delaware Lackawanna & Western Railroad name was first incorporated in 1853 as part of a consolidation of several smaller lines in New York, New Jersey, and Pennsylvania. During the 1880’s coal traffic increased, and the Lackawanna became known as the “Road of Anthracite.” By the 1950’s, the Lackawanna began friendly relations with the Erie Railroad to consolidate some terminal facilities and redundant routes. Their cooperation resulted in merger in 1960. The resultant Erie Lackawanna Railroad struggled through the turbulent 1960’s and was eventually absorbed by Conrail in 1976.